Although I’m still working on the RL printed cards, you can do us a good turn (and have fun to boot) by printing out the cards at home from these pdf files and seeing if you can follow Doc’s instructions. They are much lower res than the real cards, of course, but should print easily and without needing any printer meddling (no resizing to fit). I left the corners squared so you can cut them more easily, but the real cards will have rounded corners. Cut with an X-acto knife or a paper cutter. Be sure to let me know if I’ve left something out, or if there’s a mistake. 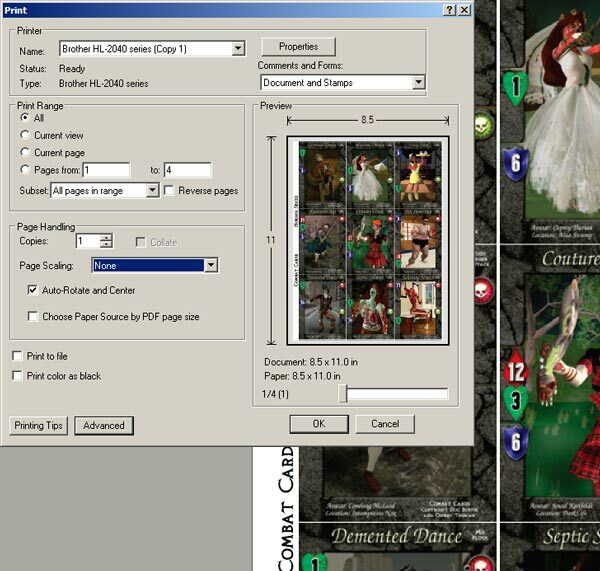 Combat Cards print-at-home game by Doc Boffin and Osprey Therian is licensed under a Creative Commons Attribution-Non-Commercial-No Derivative Works 2.0 UK: England & Wales License.